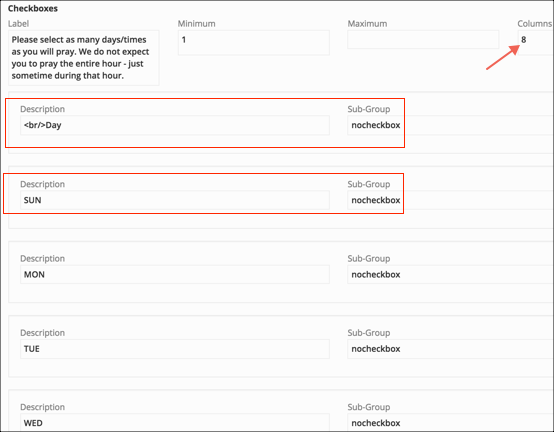 If you want to create an online registration so that people can select a time slot from a grid of slots spanning a 24 your period, submit a Support Request from your database and we will paste the necessary code into the organization you designate. 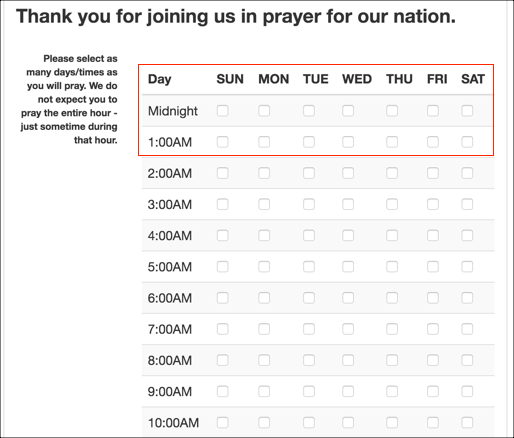 The prayer grid will present the days as a header row, with the times (each hour of the day beginning at midnight) as columns. Each day has 23 time slots. This is just a tiny section of the Questions tab when you are setting up a grid. All of the checkboxes will display on the Questions tab after you paste the code for you. As you see, this is a much more complex set up than most online registrations. But, once you set it up it works great. Also, you will be able copy and paste the code into a new organization, if you have need for more than one prayer grid. You will be copying the code from the existing organization into a new organization. The user with Admin role must do this. Go to the organization that is currently set up for a prayer grid. Select the Gear icon on the blue Toolbar and then click the control key on your keyboard. This will now display a new option. Select View Registration Document . Put your cursor in the box where you see the text, and use Control A to select everything, and then Control C to copy it. You should already have created the new organization at this point. Go to the new organization and set the Registration Type to Join Organization. While viewing the org, select the Gear icon on the blue Toolbar, and then press the Control key. Now select View Registration Document . Put your cursor at the top of the text currently displaying and then use Control V to paste all the text you copied into the Registration Document . Look at the top of the text where you see <Settings id= and replace the number that you see after the = sign with the Org ID # for the new org. Now click the blue Save button. Go to the Messages tab and set the Online Notify Person and make any changes you want to the confirmation and instructions. If you have any problems with this, please submit a Support Request from your database.